"You never know who you might meet next…" The Orchard has revealed the first trailer for the horror film Creep 2, a sequel to the cult indie horror hit Creep from a few years ago. This time the film follows a video artist looking for subjects who drives to a remote house in the forest to meet a man who claims to be a serial killer. But after agreeing to spend the day with him, she soon realizes she made a deadly mistake. Starring prominent writer/director/actor Mark Duplass, from the first film, as well as Desiree Akhavan, Karan Soni, and Caveh Zahedi. Fans of the first film have been patiently awaiting this first trailer, as the film is scheduled for VOD release in October. Will it be any good? Get a first look below and tell us what you think. Sara (Desiree Akhavan) is a video artist whose primary focus is creating intimacy with lonely men. After finding an ad online for "video work" she thinks she may have found the subject of her dreams. She drives to a remote house in the forest and meets a man claiming to be a serial killer (Mark Duplass). Unable to resist the chance to create a truly shocking piece of art, she agrees to spend the day with him. However, as the day goes on she discovers she may have dug herself into a hole she can't escape. 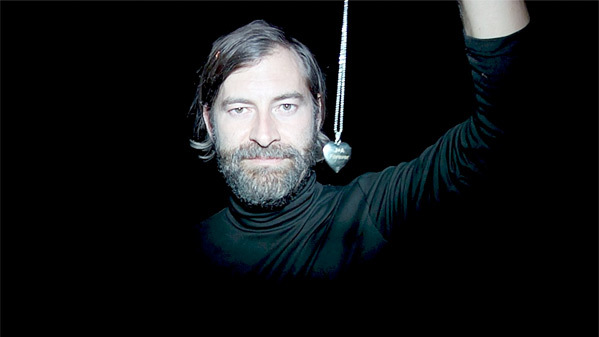 Creep 2 is directed by American filmmaker Patrick Brice, of the first Creep film and The Overnight previously, plus a few short films. The screenplay is written by Mark Duplass & Patrick Brice. This will premiere at the Telluride Horror Show coming up. The Orchard will then release Creep 2 direct-to-VOD starting on October 24th this fall.